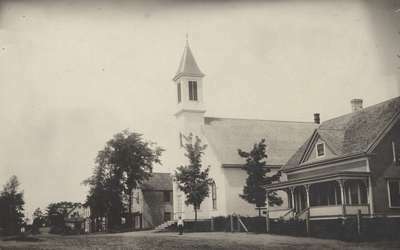 A postcard of the Presbyterian Church in Elmsdale, Nova Scotia, to Rev. R. B. Layton in Kentville, Nova Scotia, from A. H. Keyes in Elmsdale. Rev. John Cameron (1817-1907) became the Presbyterian minister in Elmsdale, Nova Scotia in 1844. He moved his family from Nine Mile River in 1862 to a large home (not a manse) in Elmsdale the same year that Elmsdale Presbyterian Church was completed. Cameron practiced his sermons by bellowing them out from the balcony of his new home. From there, he could see the church and thus knew when to depart on Sunday mornings by the number of his flock standing outside waiting for him. He left Elmsdale in 1879 and was replaced by Rev. Jacob Layton (1879-1931) who preached there until 1895. One of his sons became Rev. R.B. Layton. Today the church is St. Matthew’s Presbyterian Church.